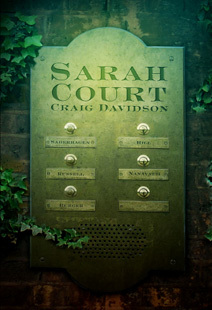 This past week I finished reading my first novel of the year; Sarah Court by Craig Davidson. 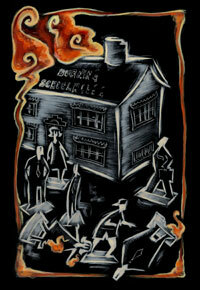 Published in 2010, the book is Davidson’s third novel — excluding those written under a pseudonym. The novel takes place in and around Niagara Falls, Ontario, following five families who all lived on the same block together — Sarah Court. Though not a collection of short stories, it is not a straightforward narrative either. The novel touches upon each family in sequence, never returning to each chapter’s narrator upon completion. Consistent with Davidson’s style, the novel is best described as intense and gritty. Many of the characters are very broken, with motifs of asphyxiation and brain damage occurring in various forms. Their broken aspects manifest in other forms as well, be they haunted, disgraced, emotionally disconnected, or downright self-destructive to themselves and those around them. When I began the novel I found the reading experience a little jarring, though at first I didn’t entirely understand why. On a dime Davidson’s narrative could often shift in time and space, the narrator’s attention becoming so fixated on a certain point that you can lose track of where the scene started. This is in no way a criticism on my part, more a point of how dense the story can be at times. This wasn’t quite the problem I had, however. I learned that what I found to be jarring about the novel is the intersecting nature of it — the story isn’t just about the character/family each respective chapter is focusing on, but what links them all together. There are links present in each chapter that connect the characters throughout the entire book, but when you first start you can’t yet appreciate what you are reading. There are some notable appearances that you will recognize later on, but for the first couple of chapters you’re just getting to know who some of these people in this little community are. The experience was almost like hearing someone reference something, knowing they’re making a reference, but not knowing what to. The novel starts off appropriately simpler with Wesley Hill, the father of a washed-up stuntman, Colin Hill, who intends to go over Niagara Falls in a specially designed barrel. Although parent-child relationships is another motif that is significant throughout, I say it is simpler because the story of this chapter is more about laying a groundwork, and not so much drawing connections through the links between characters. As a result, I find the father-son relationship in this chapter to be more at the forefront than others. The Hill family, though a part of the Sarah Court community, is the least connected and impactful to the lives of the other families, so they work as a way of easing the reader into the novel’s world. As the chapters progress, you can start to see how all the characters intersect and affect/affected each other’s lives, often in ways the characters themselves are not aware of. This ranges from learning two characters were at the same place at the same time without realizing it, to the death of a family pet being more nefarious than simple illness or accident. These connections are not often very obvious either, making their discovery a more enriching reading experience for me personally. One aspect of Sarah Court that I have very mixed feelings about is the supernatural element, in the form of strange entity, that itself is not certain if it is a demon or an alien. It doesn’t appear in the text often, sitting mostly at the fringes of the narrative, but I cannot decide whether or not I like its presence. On the one hand, I really like supernatural/fantastic ideas and I don’t find them to be out of place in urban settings. On the other hand, I did find it to be a little out of place in the novel’s narrative. It isn’t a huge negative factor, all things considered, I just wonder how necessary it really was. Regardless, Sarah Court is expertly written, with a compelling narrative and very human cast of characters. It is not a feel-good story; at best it can be bittersweet. This doesn’t hurt the quality of the novel, just don’t expect to be uplifted by this narrative excursion. For those interested in reading something that shows a very blunt and gritty depiction of humanity that doesn’t pull its punches, I highly recommend it.